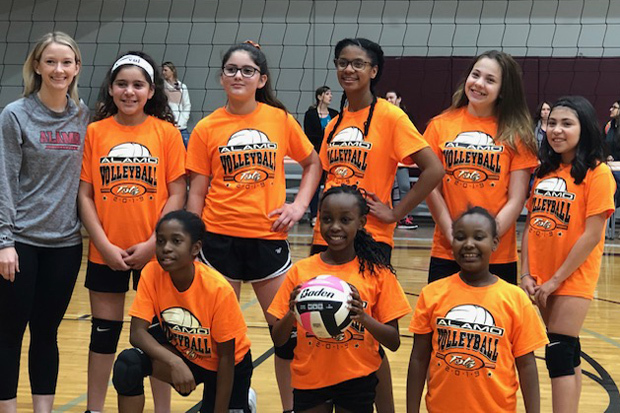 The Alamo 2019 Summer Totz Volleyball League will offer Registration for pre-assembled teams, club teams, small groups of players and individuals looking to form a team. Player Registration: Pre existing teams, small groups or individuals can ALL register and Alamo will place them in the Summer League. Alamo will place 8 to 10 players on all teams. Coaches: Alamo Volleyball will provide each team with a coach that is trained and has experience teaching and playing the game of volleyball. Pre-assembled teams may provide their own coach or have one appointed from Alamo. League Cost $180.00 (Reduced Summer Fee) This Fee includes: coach, game shirt, practices, matches, and awards. Refund Policy: No refund (team or player) after June 1st. for individuals looking to form a team, small groups, and pre-assembled youth teams! Individual Player Registrants: will consist of individuals that register and Alamo will place them on a team or with a small group. Alamo will place 8 to 10 players on all teams. Team Registrants: will consist of pre assembled youth teams 3rd to 6th grade (or small groups still needing players) that join as a group. To join as a small group or team you must have a minimum of 2 players and a max of 10. In the comment section please put names of who is in your group that you wish to play with. Practice: All teams will receive 8 practices and 7 Games on Mondays 6:00pm-8:00pm. The 1st group skills training and formation of teams will be March 25th. Players will have a team practice and scrimmage Monday April 1st through May 13th teams will practice 6:00-7:00 and then play 7:00-8:00. Matches: All teams will practice 6:00-7:00 followed by a match 7:00pm-8:00pm. Competitions will begin April 1st and conclude May 13th. Awards will be given to all participants. League Cost: $210.00 includes Team Shirt, Practices, Matches, and Awards. Rules: Players will play with the Volleylite Ball, modified serving and rotation rules to encourage proper technique and maximize playing time. Every player will play in every game. The Alamo 2019 Summer Volleyball League will offer Registration for pre-assembled teams, club teams, small groups of players and individuals looking to form a team. Congratulations to all the girls and coaches in the 2018-19 Winter Totz League. Cornerstone Totz wins first place in the Winter League.